Where did the tropical cyclones go this season? In short – the western Pacific. The Atlantic Basin was predicted by many to have an active season. But the season ended November 30th, and it was a very quiet one. There were 13 named storms in the Atlantic, of which two developed into hurricanes. The Accumulated Cyclone Energy (ACE) Index is used by the National Oceanic and Atmospheric Administration (NOAA) to measure the severity of hurricane seasons. It considers the intensity and the lifespan of storms. The 2013 Atlantic season was well below normal; the ACE index came in at 33, about 31% of the 1981-2010 average of 104. 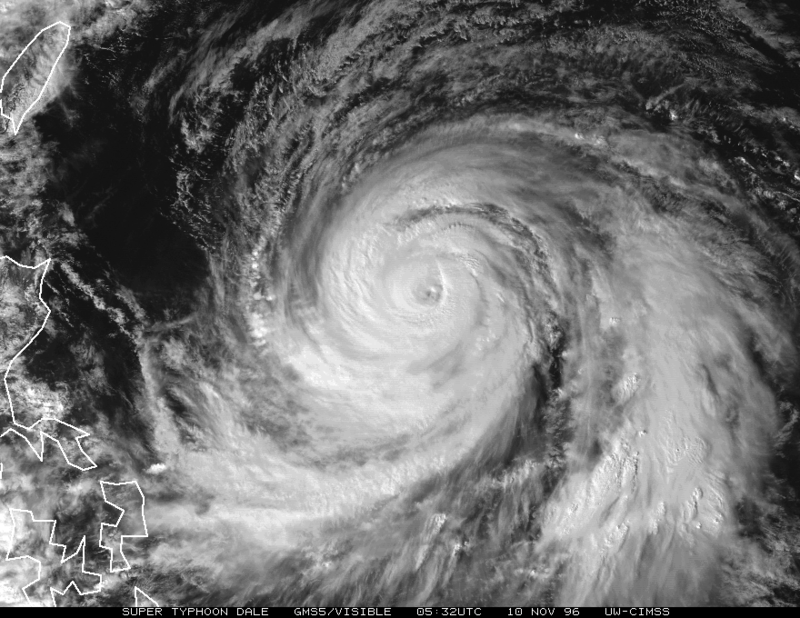 Super Typhoon Dale (1996) was one of our featured storms on Cyclone Center this year. On the other side of the planet, in comparison to the Atlantic Basin, the western Pacific appears to be the ‘hot spot’ this season for strong tropical cyclones. The western Pacific has seen 31 storms, 13 being typhoons (in this region, hurricanes are called typhoons). This makes the western Pacific season slightly above the 1981-2010 average of 26 named storms. The ACE index for the Western Pacific, however, stands at 268.3 – about 88% of the 1981-2010 average of 302. Typhoons such as Lekima, Usagi, Fransico and of course Super Typhoon Haiyan(Yolanda) will be recorded in the 2013 history book. A super typhoon is a typhoon whose winds exceed 150 mph, equivalent to a Category 4 or 5 hurricane on the Saffir-Simpson scale. What has contributed to the strong activity seen in the western Pacific this season? A combination of the right ingredients is the answer. A tropical cyclone needs favorable conditions, such as moisture, warm sea surface temperatures, and lack of wind shear in the upper atmosphere in order to aid development. Based on the activity in the western Pacific, it is likely that those conditions were present much of the season. The 2013 tropical cyclone season was bittersweet for many; those in the Atlantic were glad for a quiet season while many in the western Pacific were forced to make preparations all season. Our prayers are with those affected by these forces of nature. Visit Cyclone Center to classify many storms including those past storms that formed in the western Pacific, such as: Supertyphoon Dale (1996), Super Typhoon Herb (1996), Typhoon Faxai (2001), Super Typhoon Mike(1990) and more. – Davanna G. Saunders is an undergraduate student in Atmospheric Sciences at the University of North Carolina at Asheville. She recently joined the Cyclone Center team as a classifier and contributor to our social media.